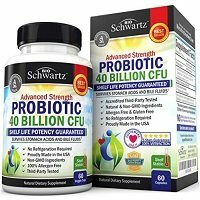 BioSchwartz Advanced Strength Probiotic gets 1.5 out of 5 stars. On paper, this supplement seems like a decent probiotic choice. However, my experience with it was far from decent. But I’ll start on a positive note. I like that this probiotic is shelf stable and doesn’t need to be refrigerated. It’s 100% allergen free, non-GMO, preservative free, and third party tested. It also uses strains that are well researched and popular in probiotic supplements. That ends it for the pluses of this probiotic. First and foremost, it just didn’t gel with me. I had bad side effects the whole time I took it. It says to give it at least 4 weeks for the side effects to go away (which I did) and I still had them. I also never saw any improvement with my IBS symptoms. It just flat out didn’t work for me and actually made me feel worse. Maybe I’m just an isolated case but I’ve tried so many probiotics and actually depend on them for relief. You have to take 2 capsules daily, 1 during the day and 1 in the evening. I prefer just one and done. And the capsules always got stuck in my throat for some reason, which I hate! This supplement is for people 18 years and older, so it’s not safe for kids. Last but not least, this company is so sales-y. The websites has quite a few pop-ups and the box and bottle itself are covered in ads and information. They even have 2 different pamphlets and coupons folded up in the actual box. I appreciate all the info I can get but it was like information overload. And they’re trying to get you to sign up for audio books and free bottles and all sorts of things. It was just too much and that’s a pet peeve of mine. A good product usually speaks for itself and doesn’t have to use every gimmick in the book to get you to buy it. Overall, this probiotic was just a flop for me. It’s no surprise that BioSchwartz Advanced Strength Probiotic has 40 billion colony forming units or CFUs and 4 probiotic strains. One of which is Lactobacillus acidophilus La-14. I like this probiotic because it’s well researched and helps in a number of different areas. It’s been shown to help prevent and treat diarrhea, reduce harmful pathogens in the gut, and help alleviate constipation. Research shows that L. Acidophilus may also help treat and prevent urinary tract infections (UTIs). Another strain they use is Bifidobacterium lactis BI-04. This strain has been shown to strengthen the immune system and reduce harmful inflammation. It’s also shown to be beneficial for the entire GI tract. Other benefits of B. Lactis are better oral health, improved digestive disorders, and reduction in seasonal allergies. BioSchwartz Advanced Strength Probiotic doesn’t have any allergy concerns listed. The supplement is FREE of lactose, soy, wheat, nuts, iron, sugar, chemicals and artificial colors. The other ingredients include: cellulose (vegetable capsule), rice maltodextrin, and L-Leucine and Polysaccharides Complex. A bottle of 60 capsules costs $19.95 plus $5.95 for shipping. Since you take 2 per day, it lasts 30 days. It ends up being $0.66 to take this probiotic every day (or $0.86 if you factor in shipping costs). That’s about average, maybe just a tad above. Nevertheless, I don’t think it’s a good value for the price. I did have side effects with this probiotic. I had a headache, stomachache, and was bloated. I just didn’t feel well at all. The company says to give it at least 4 weeks to get used to the probiotics because side effects are normal. Even after the 4 weeks I still had negative side effects. To make matters worse, I never saw any positive effects! BioSchwartz offers a 30-day money back guarantee. Refunds and exchanges can’t be given for purchases over 30 days. If you want a refund, email their customer service center at support@bioschwartz.com. If they approve your case, they will send an email notifying you how and when they’ll proceed with the refund. To buy BioSchwartz Advanced Strength Probiotic, click here.